Easily correct your teeth’s imperfections and gain confidence with dental veneers from our Issaquah dental experts! Fixing almost any smile flaw. Veneers are a procedure provided here at Issaquah Highlands which results in a well-aligned, brilliantly white smile. The veneers correct such maladies as: discolored, uneven, chipped, misaligned, uneven, or abnormally spaced teeth. Each veneer utilizes a powerful adhesive and is affixed to the outer face of each affected tooth to improve their appearance and strength. Veneers are normally constructed of either a special porcelain or resin composite materials. Many prefer the superior aesthetic properties of porcelain veneers, which are believed to have a greater ability to simulate the shimmer of natural teeth and their well-known stain resistance. As years pass through our lives, enamel, the protective outer layer of our teeth, can become dulled, eroded, and tarnished with age and usage. Veneers can reverse much of this wear, and restore a healthy smile due to factors such as: uneven teeth, excessive wear, hereditary faults, or discoloration. In the end, you’ll have a smile to be proud of. Veneers also follow the rule of “form following function”. They serve an additional purpose as a safeguard for the natural surface of an affected tooth, in addition to improving its appearance. Veneers are affixed to existing tooth structure and are very slight in stature also means minimal modification of your teeth is necessary to ensure a lasting restoration. Veneers are typically made of porcelain so they match the shading of your teeth as closely as possible. This means Dr. Vanama can craft veneers to look natural and match your personality and facial characteristics. You’ll finally be able to smile with confidence. Would definitely recommend to those who have any phobia of the dentist-- Discovery Dental does an exceptional job at making you feel comfortable and have provided a quick and pain- free experience every time for myself. Veneers are typically made from porcelain so they match the shading of your teeth as closely as possible. During your first appointment, Dr. Vanama takes an impression of the tooth receiving the veneer. She then sends the mold to our dental laboratory. Our technicians follow the specifications to create a customized tooth shell for you. It takes approximately two to three weeks for your dentist in Issaquah to receive your new veneer back from our dental laboratory. However, she can fit you with a temporary restoration in the meantime. Before Dr. Vanama can place your new veneer, she may need to remove up to one-eighth of a millimeter of enamel from your tooth. This is to ensure that the veneer fits properly and the treated tooth doesn’t stick out further than the rest of your teeth. Our office will contact you for a final fitting after Dr. Vanama receives your veneer back from the lab. After checking the color and shape of your new veneer, the next step is for Dr. Vanama to place a bonding agent to the front of your tooth. She then carefully places the veneer on top of it and uses a curing light so it hardens in place. The process is fast and simple, and you leave our office with a beautiful new smile. 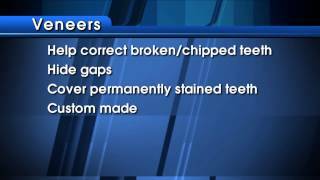 Why are veneers a solution to dental problems? As years pass through our lives, enamel, the protective outer layer of our teeth, can become dulled, eroded, and tarnished with age and usage. A solution is to place dental veneers, which can reverse much of this wear, and restore a healthy smile due to factors such as: uneven teeth, excessive wear, hereditary faults, or discoloration. The latter is often related to genetics, but personal diet choices are also attributable for the formation of stains on our teeth. As we reach advanced age, our teeth become more susceptible to cracking, chipping, and damage caused by wear, negatively impacting their appearance. The application of dental veneers may be recommended by your Issaquah dentist as a suitable remedy. It is important to follow a good oral hygiene routine while also avoiding habits that could cause your new veneer to become loose. As long as you do this, your veneer should last up to 10 years before you need to replace it. If you notice any problems with it after placement, just contact us to schedule an appointment for repair. This should only take a few minutes for minor issues. I've heard of Lumineers®. What is that? Lumineers® are reversible, thus allowing additional options for the patient in the future since the structure of the tooth is not penetrated beyond the outer enamel. If you believe you or your loved one may reap the benefits of veneers, please contact our staff at Discovery Dental today.